Elena Kagan has never served as a judge, but as solicitor general has argued cases before the Supreme Court. 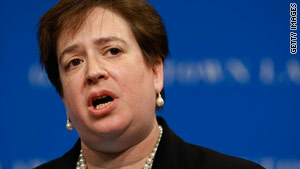 Washington (CNN) -- President Obama has selected Solicitor General Elena Kagan as the Supreme Court nominee to replace the retiring John Paul Stevens, a legal source close to the process told CNN Sunday evening. The nomination is expected to be announced Monday at 11 a.m., another source familiar with the process said. Kagan, 50, a New York native, was widely reported to be the frontrunner for the nomination. She was a finalist for the high court vacancy last year when Justice Sonia Sotomayor was selected to replace the retiring David Souter. Kagan would be the third woman on the nine-justice bench if confirmed. Kagan received her law degree from Harvard University where she later served as dean of the law school. She previously served in the Clinton administration as associate White House counsel. In 2005, when she was dean of Harvard's prestigious law school, she light-heartedly greeted conservative legal minds who were meeting there with: "You are not my people." She warmly welcomed the thousand or so members of the right-leaning Federalist Society but let them know she shared few of their views on the law and society. Yet the conservative and libertarian faithful that night cheered Kagan's honesty and willingness to mix it up with her ideological opposites. It is that reputation as a consensus-builder that has earned the solicitor general positive reviews on the left and right. Those bipartisan skills, and her limited public comments on hot-button issues, have generally kept Republican criticism at bay and, even before the weekend, put the lawyer and policy-maker near the top of the contenders for the Supreme Court nomination. "Kagan has a lot of fans on the right as well as the left from her time as the dean of Harvard Law School," Thomas Goldstein, a noted Washington attorney and founder of scotusblog.com, said before her pending nomination was reported. "She's someone who is an intellectual, who has earned a lot of respect. She's relatively young, a woman and doesn't likely generate a significant political fight." But although she has never served as a judge, some on both the left and the right have found aspects of the New York native's record troubling, and she could expect tough questioning on such issues as homosexual rights and national security. President Obama did not have to look far when considering Kagan. As solicitor general, she is the administration's top lawyer before the Supreme Court and has argued several high-profile cases before the justices since taking the job in spring 2009. She was a finalist for the high court vacancy that year, when Justice Sonia Sotomayor was selected. "You have to admit, Elena Kagan is a brilliant woman," Sen. Orrin Hatch, a Republican on the Judiciary Committee, said during a radio interview a year ago when Kagan was being vetted for a high court seat. "She is a brilliant lawyer. If [Obama] picks her, it is a real dilemma for people," especially conservatives like himself. "And she will undoubtedly say that she will abide by the rule of law." Her confirmation hearings for the solicitor general job could offer a preview of what she can expect from both Democrats and Republicans. Many saw it as a dress rehearsal of sorts for a high court job. GOP Sen. Lindsey Graham of South Carolina told Kagan she presented a "positive impression." Democrats were similarly enthused. With that endorsement, she won confirmation for her current job by a 61-31 vote. Kagan was born in April 1960 and grew up in a Jewish household in the Upper West Side of Manhattan. She went on to Princeton University and Harvard Law School. She served as a law clerk for well-known liberal federal judge Abner Mikva and then for liberal Thurgood Marshall on the high court. In her 1986 job application to Marshall, she rather matter-of-factly told the civil rights pioneer, "I would be honored to serve as your clerk." The nation's first African-American justice affectionately called the diminutive Kagan "Shorty." Kagan later went into teaching, starting at the University of Chicago, where one of the part-time faculty was Obama. Also teaching at the time was Diane Wood, who later became a federal judge and also is a finalist for the current high court vacancy. Kagan and Wood were among the few women on the full-time faculty at that time. President Clinton later named Kagan associate White House counsel and then appointed her to the influential Domestic Policy Council, where she earned a reputation for articulate and well-reasoned statements on tricky political issues. She was the administration's point person on passing anti-tobacco legislation, negotiating in 1998 with Republican Sen. John McCain to give the federal government the authority to control cigarettes, as it does pharmaceuticals and medical devices. The president picked her in 1999 for the powerful U.S. Court of Appeals for the D.C. Circuit. But no Senate confirmation hearings were held, and the nomination lapsed. The seat was later filled by John Roberts, who quickly used the appointment as a springboard to chief justice. Named Harvard's dean in 2003, Kagan earned a reputation for soothing longstanding tensions over a perceived liberal tilt to the faculty and curriculum. She began pushing for the appointment of conservative professors, including Jack Goldsmith, a onetime lawyer in President George W. Bush's Justice Department. Goldsmith was noted for privately expressing concern over the so-called Bybee Memo, or torture memos, that offered executive branch endorsement for harsh interrogation techniques by the CIA against suspected high-level terror suspects. Such hires eased ideological unrest on the Harvard campus. "I have no doubt her heart beats on the left," said Charles Fried, a Harvard colleague of Kagan's who also was a solicitor general under President Reagan. But he said Kagan saw her role as dean to foster understanding, and "she would do it by recruiting excellent teachers from across the ideological spectrum." Fried, who himself was considered for the high court under several Republican presidents, has nothing but praise for Kagan's skill as a lawyer and administrator. But she has drawn criticism, too, from conservatives over her strong efforts to try to block military recruiters from Harvard because of the current "don't ask, don't tell" policy on removing openly homosexual service members. Kagan supported other schools challenging a federal law requiring that recruiters be given equal access or face the loss of federal funding. The Supreme Court unanimously upheld the law in 2006. Just four months after taking the job as dean, in October 2003, Kagan told students in a campuswide e-mail, "This action causes me deep distress. I abhor the military's discriminatory recruitment policy." She called it "a profound wrong -- a moral injustice of the first order." "I was at Harvard Law School when Elena Kagan became dean, and the liberals have no need to fear. She is one of them," said Carrie Severino, senior counsel at the Judicial Crisis Network, a conservative legal group. As the recruiting controversy showed, Severino said, "She is not a conservative." Nor is she really very liberal, say some progressive groups, and that worries many on the left. Her views on executive authority in particular have raised some eyebrows. As chief defender of the administration's anti-terrorism strategy, Kagan has articulated a more robust defense of the White House than many civil rights and human rights groups would like. "There's a real concern about Solicitor General Kagan with respect to national security issues," said Vincent Warren, executive director of the Center for Constitutional Rights, which has defended dozens of prisoners held at Guantanamo Bay, Cuba. "We do know from how she addressed the issue at her confirmation proceedings, and I certainly can't see anything that would lead me to believe that she would have a less expansive version of what executive power is than certainly the current form, and certainly with respect to how George W. Bush viewed it. So I think there's a real concern for human rights groups." Warren's group wonders whether as a justice, Kagan "might go with what the Obama administration and what the Bush administration had put in play rather than seriously challenging that." Her supporters counter with a 2001 law review article in which Kagan articulated, in a pre-September 11 environment, the consequences of the "unitary executive" theory that was promoted in the Clinton administration where she worked and later enthusiastically embraced by the Bush administration. Kagan concluded, "President Clinton's assertion of directive authority over administration, more than President Reagan's assertion of a general supervisory authority, raises serious constitutional questions." And many progressive groups say they have been quietly assured by the White House of its confidence that Kagan will be a "reliable" liberal voice on the divided Supreme Court, where conservatives hold a slim, shaky majority on a range of hot-button issues. Kagan would be a liberal replacing a liberal and unlikely to immediately move the court to the left. Nevertheless, many on the right worry what a Justice Kagan would bring to the court. "While she ... has at least acknowledged some role for executive power that a lot of liberals were trying to hide all together in this current administration, I think the conservatives should find that troubling," Severino said. "Because the president has been appointing 'czars' [to deal with the health care and financial bailouts] that have uncertain constitutional merit. I think that actually should raise concerns with conservatives." Kagan had never argued a case in person before an appeals court before she took over as solicitor general. Now she has argued six cases herself before the justices, and supervised other cases where the federal government was a party. Despite her lack of experience, she appears to be pretty well accepted by the often skeptical court, displaying equal amounts mastery of often-dense legal language and a brisk, conversational style that reflects a confidence in her abilities to articulate the administration's positions. One member of the court has repeatedly questioned Kagan's reasoning. Chief Justice Roberts last month labeled as "absolutely startling" the solicitor general's argument that a when one federal prosecutor drops criminal charges, another prosecutor need not do the same. "The different U.S. attorneys all work for your boss, right?" Roberts asked. "They work for the attorney general," and his final decision holds. "The United States government is a complicated place," Kagan replied, not willing to back down, arguing that various individual offices should be allowed discretion to decide such matters as they fit. The first case she argued before the court was a blockbuster: whether to open federal campaign spending to corporations -- businesses, unions and advocacy groups -- seeking a greater voice in the crowded political debate, mainly through ads. Roberts seemed concerned that Kagan appeared to abandon at argument a key point made earlier by the administration: that current campaign spending limits are necessary to ensure that corporate speech does not overwhelm the voices of individual voters. "We do not rely at all on that," Kagan noted. Roberts pounced. "You are asking us to uphold [past precedent on spending limits] on the basis of two arguments, two principles, two compelling interests we have never accepted in the expenditure context." "Fair enough," Kagan brusquely acknowledged. The court ruled in favor of expanding spending power for corporations, and Roberts noted Kagan's mixed messages. "To the extent that the government's case for reaffirming [precedent] depends on radically reconceptionalizing its reasoning, that argument is at odds with itself." In a separate argument, Kagan tried to turn the tables, posing a question to Justice Antonin Scalia. "Well, I'm not making the argument," said the usually verbose justice. Roberts was more blunt. "Usually, we have the questions the other way," he said sternly. But her appearances have not always been tense. In January, Kagan stumbled when addressing Scalia. "Mr. Chief Justice -- excuse me, Justice Scalia -- I didn't mean to promote you so quickly," she said. Replied Scalia to Kagan, "I'm sure you didn't," bringing huge laughter in the courtroom. "Thanks for thinking it was a promotion," said Roberts, the real chief justice, this time smiling. CNN's Bill Mears, John King and Ed Henry contributed to this report.